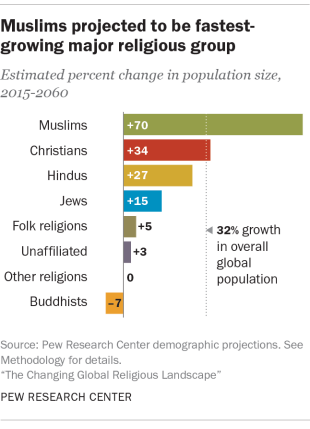 In the next half century or so, Christianity’s long reign as the world’s largest religion may come to an end, according to a just-released report that builds on Pew Research Center’s original population growth projections for religious groups. Indeed, Muslims will grow more than twice as fast as the overall world population between 2015 and 2060 and, in the second half of this century, will likely surpass Christians as the world’s largest religious group. While the world’s population is projected to grow 32% in the coming decades, the number of Muslims is expected to increase by 70% – from 1.8 billion in 2015 to nearly 3 billion in 2060. In 2015, Muslims made up 24.1% of the global population. Forty-five years later, they are expected to make up more than three-in-ten of the world’s people (31.1%). The main reasons for Islam’s growth ultimately involve simple demographics. To begin with, Muslims have more children than members of the seven other major religious groups analyzed in the study. Muslim women have an average of 2.9 children, significantly above the next-highest group (Christians at 2.6) and the average of all non-Muslims (2.2). 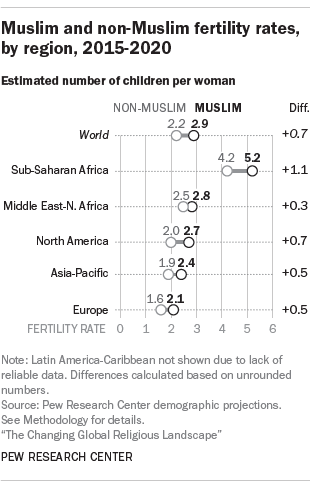 In all major regions where there is a sizable Muslim population, Muslim fertility exceeds non-Muslim fertility. The growth of the Muslim population also is helped by the fact that Muslims have the youngest median age (24 in 2015) of all major religious groups, more than seven years younger than the median age of non-Muslims (32). A larger share of Muslims will soon be at the point in their lives when people begin having children. This, combined with high fertility rates, will accelerate Muslim population growth. More than a third of Muslims are concentrated in Africa and the Middle East, regions that are projected to have the biggest population increases. But even within these high-growth regions – as well as others – Muslims are projected to grow faster than members of other groups. For example, Muslims in sub-Saharan Africa, on average, are younger and have higher fertility than the overall population of the region. 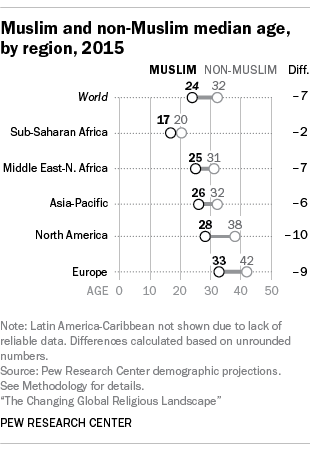 In fact, Muslims are expected to grow as a percentage of every region except Latin America and the Caribbean, where relatively few Muslims live. The same dynamics hold true in many countries where Muslims live in large numbers alongside other religious groups. For example, India’s number of Muslims is growing at a faster rate than the country’s majority Hindu population, and is projected to rise from 14.9% of India’s 2015 population to 19.4% (or 333 million people) in 2060. And while there were similar numbers of Muslims and Christians in Nigeria as of 2015, Muslims have higher fertility there and are expected to grow to a solid majority of Nigeria’s population (60.5%) in 2060. Meanwhile, religious switching – which is expected to hinder the growth of Christians by an estimated 72 million between 2015 and 2060 – is not expected to have a negative net impact on Muslim population growth. This is an update of a post that originally published on April 23, 2015.